This is Part Five of my week-long celebration of eggs. L and I have one simple, sacred agreement that goes like this: I agree not to bring blood sausage into the house and she agrees to stay married. What she has against a “pudding” of congealed spiced pig’s blood and fat, I will never understand, but a deal is a deal. So, before I go any further, let me state this directly to my wife on the off chance she reads this : L, I would never, ever bring blood sausage, also known as black pudding or blood pudding, into our happy home. And, furthermore, even though it is considered, in its many forms, a delicacy all over the world, I am steadfast in my resolve never to cook with it, especially not while you are out at book club or whatever that was on Tuesday night. There, that ought to do it. This very simple dish (made in a rented kitchen far away) was inspired by one that was on the menu of Cibo Trattoria a renowned Italian restaurant in Vancouver, which is where, a month ago, I tasted it and instantly renewed my long-dormant love for blood sausage. Cibo Trattoria’s version used house-made sausage and aged balsamic. I used the best sausage I could find, pan-fried it in a little oil for two or three minutes on each side for some crispy caramelization. I was out of aged balsamic so I used a glaze, which is very easy to make (see below) from inexpensive balsamic vinegar and is great to have on hand. In either case, however, it was the gently fried egg on top that really pulled this very simple dish together. 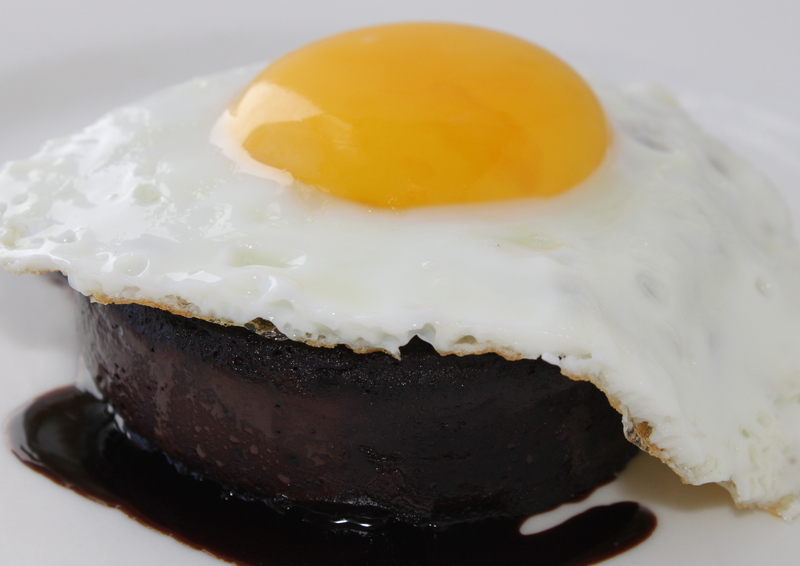 The silky, creamy yolk oozed over the sausage and mixed with the sticky puddle of balsamic underneath. It was, all at once, sweet, salty and incredibly rich. A perfect appetizer. But, I warn you: make this at your own risk; I’m in enough trouble as it is. Mix vinegar and sugar and bring to a boil over medium heat. Reduce heat and reduce until about 75 per cent of the vinegar has evaporated and coats the back of a spoon. Cool. This sweet glaze can be used on meats, fish and even ice cream. Keeps indefinitely. This entry was posted in Appetizers, Eggs. Bookmark the permalink.